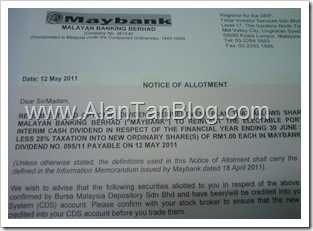 By today, you should received the Maybank Dividend Reinvestment Plan Notification if you apply for one. 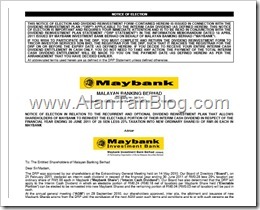 I hope you did apply for it as Maybank is one of the Blue Chip counter in Bursa Malaysia and getting Maybank shares on discount price. All your shares will be automatically credited into your Central Depository System(CDS). This entry was posted on Wednesday, May 18th, 2011 at 9:31 am	and is filed under stock market. You can follow any responses to this entry through the RSS 2.0 feed. Both comments and pings are currently closed.